Re-refined oil? Does that mean you drain the oil from someone else's car and put it in mine? Sounds sketchy! Well, yes and no.... Last month we completed the switch from using virgin oil in the most commonly specified grades, 5w-20, 5w-30, and 10w-30, to using re-refined oil in our oil changes at Hawthorne Auto Clinic. So we better have a good explanation. 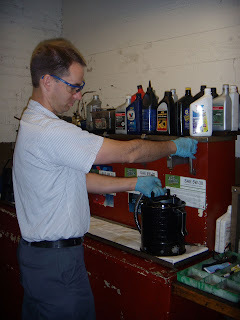 The process of creating base stocks for re-refined oil begins with the collection of used oil drained from customer vehicles at our shop and and many others. This oil, contaminated with moisture, engine wear products, and chemical byproducts of combustion, is transported to the refinery. In a process similar to that of refining crude oil, but using 85% less energy, it is converted into re-refined base oil, and combined with an additive package similar to that used for virgin oil. gasoline, and other light-boiling components are "flashed out" of the feedstock. Next, vacuum distillation strips away diesel fuels and gas oils which can be used in asphalt roofing and refinery fuel. Dirt, polymers, heavy metals and other contaminants are removed from the resulting base lube stock by the thin-film evaporator. Hydrofinishing uses hydrogen to remove sulfur and chlorine compounds, purifying the base stock. Finally, an additive package is blended in to produce oil that meets or exceeds auto manufacturers' warranty requirements and the American Petroleum Institute's motor oil specifications. maximum lifespan from their vehicles, it's important to us that re-refined oil meets the latest API SM and ILSAC GF-4 specifications. Most governmental agencies as well as corporations like UPS and Frito-Lay use it in fleets (the US Postal Service has used it for over 10 years), Mercedes Benz uses it as factory fill in new cars, and it even sees use on the NASCAR circuit. We have been using it in our own vehicles and by customer request for a number of years and have never seen any engine problems related to its use. That said, some manufacturers do require full synthetic or other specialty oils to meed warranty requirements for several models, and we always confirm we are recommending oil specified by the manufacturer when we are changing a customer's oil. Environmental degradation associated with the production and use of petroleum is much in the news lately, and obviously the solution must be multifaceted. In addition, it's estimated that more than 350 million gallons of used motor oil is disposed of improperly each year, mostly a gallon at a time by do-it-yourselfers, and is thought to cause more than 40% of the total oil pollution of our waterways. Before the re-refining process became common, much oil from shops was either burned on-site for heat or collected to burn as fuel elsewhere, adding heavy metal emissions and greenhouse gases to our atmosphere. Help close the loop - use re-refined oil in your vehicle.